Town of Berlin, MD named Partner of the Year by Chesapeake Ghosts. $1000 awarded. Tickets for our 2019 Winter/Spring bus tours are on sale NOW! Bus tours are 4-5 hours long, and we use a luxury motor coach with a restroom on board. Guests deboard the bus at several locations – graveyards, historic buildings, etc. AND on the bus tours, there are some properties that we GO INSIDE. Seating is LIMITED and advanced registration is required. Tickets can be purchased here or over the phone at 443-735-0771. Welcome to Chesapeake Ghost Tours. 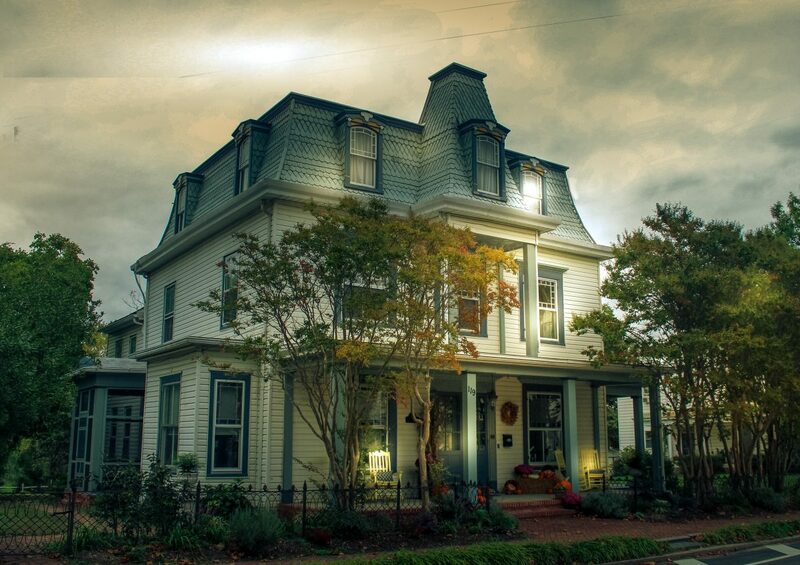 The Largest Trail of Year-Round Ghost Tours in America – 11 Ghost Walks in different historic towns, paranormal investigations, storytelling sessions and bus tours all on Maryland’s Eastern Shore. Chesapeake Ghost Tours on Maryland’s Eastern Shore is the largest cluster of heritage walks in America. Eleven year-round night-time walks – from St. Michaels to Denton to Berlin and Ocean City to the Great Pocomoke Forest. The walking tours are scattered over 100 linear miles on the Delmarva Peninsula and offer guests a 1.5 to 2-hour storytelling session about the history and mysteries of the Eastern Shore. All stories are based on historical research, and many of the 130 sites on these tours still have paranormal activity today. Each walking tour features a nighttime walk through an old graveyard (except Ocean City. No graveyards in Ocean City.) and is guided by a trained storyteller who is passionate not only about the stories, but about explaining the strange energies and events that happen in this wide-open, mostly undeveloped landscape that is still the most rural part of the Eastern part of the United States. The Ghost Walks are storytelling events where guests are led on a walk with stops at 7 to 12 properties with a haunted history. Most still have paranormal activity. The Storyteller will talk about the history of the site, the paranormal activity or haunting associated with the site, and what people say today about the haunted activity. We do not enter properties. These ghost walks are not “ghost hunts” and we do not guarantee a ghost sighting or a paranormal experience. We do, however believe that the hauntings are real and that the highly intuitive may be able to sense beings from the eternal world. For those who like a more “interactive” look at spirits and paranormal activity, Chesapeake Ghost Tours offers paranormal investigations where guests can watch actual paranormal investigators use specialized equipment to detect communications from the spirit world. Guests can bring their own equipment and also enjoy a night-time walk led by an investigator through the haunted swamps and forests as well as an “inside” experience in a historic building, mansion, or church depending on the host property. BUS TOURS – Offered mainly in the winter months – Chesapeake Ghost Tours also has six different bus tour products that go out into the beautiful countryside – focusing on stories of farmers, slaves, merchants, waterman and ghosts of the swamps forests and old plantations. Book a bus tour for your group or go on one of ours. STORYTELLING – Chesapeake Ghost Tours also offers storytelling sessions at various locations on the Eastern Shore, and we can be privately booked for your group or event. PRODUCTS & SERVICES – Ask about our Group Discounts, Students & School Groups, Private Tours, Storytelling Sessions, Bus Tours and Special Occasions. BOOKS AND GIFT CERTIFICATES – COMBOS – Order signed copies of Mindie Burgoyne’s Haunted series. Order set of 4 and receive free gift wrapping. Gift certificates also available as well as Book/Gift Certificate combinations. Voted Best New Heritage Initiative by the Lower Eastern Shore Heritage Council. Together this cluster of ghost tours includes over 140 haunted sites and stories and 10 graveyards. The spirits of pirates, sea captains, merchants, governors, soldiers, slaves, orphans, farmers, witches, hoteliers, doctors, actresses and “ladies of the evening” are featured characters in these enchanting stories. The haunted history of the old Eastern Shore is revealed in these tours in a way that is both entertaining and engaging. Our guests get a broad perspective of the Eastern Shore’s “haunted” heritage. Where are our Ghost Tours? Our ghost walks are spread across the Delmarva peninsula on Maryland’s Eastern Shore. Some tours are as close as 30 minutes from the Chesapeake Bay Bridge and within 2-3 hours of Washington, DC, Philadelphia PA, Baltimore MD and Wilmington DE. The map shows the locations. Haunted Trifecta – Ocean City – two sights with a murder, suicide and accidental death. Haunted Crossroads – Salisbury – Ghosts of the plaza, firehouse, mansion, shirt factory and a very eerie courthouse. Rowdy Women –St. Michaels – Spirits of rowdy women – Ladies of the evening, fussy landlady, vanishing hippie and a woman who throws wine glasses. Haunted Capital –Easton – haunted capital – Easton was the eastern capital of MD. It has a haunted courthouse, jail and secret passage known as Magazine alley, plus 2 healing trees. Most Haunted Jail –Denton is the county seat of Caroline County and its courthouse green was the site of 2 lynchings and has six allegedly haunted sites on facing streets. Plus the most actively haunted jail on the Shore. Haunted Maritimes –Crisfield – Sea Captains, Seafood Barons, and everything Crabby haunts this old waterman’s town. Each tour is led by a ghost storyteller who will weave the history of the town through tales of apparitions, psychic phenomena and things no one can explain. Every tour is suitable for adults and kids, Except for Princess Anne (no children allowed). The Chesapeake Ghost Walks weave a tapestry of local lore and legend and reveal the rich heritage of the Eastern Shore and the essence of its unique character. Once you’ve gone on a ghost walk, that town will seem like an old friend. The Eastern Shore – that is the land east of the Chesapeake Bay – encompasses hundreds of square miles of rolling farmland, forest and marsh, and the Eastern Shore is the least developed contiguous piece of agricultural land between Maine and Florida. The landscape is flat and open with big skies and a shoreline is never far away. It’s an enchanting landscape that has remained largely unchanged since the British colonization. Tucked into that mystical landscape are small towns that grew up with the seafood, farming and shipbuilding trades. They were full of crazy characters, and there’s something magical about that open landscape that opens portals into the “other world” and the spirits of those characters peek through now and again. They may meet you on the stairs of your hotel or in a museum full of artifacts, on a nighttime walk through town, in your campsite, on a carousel ride, or in your guest room at a historic Inn. You’ll be “walking with some of them” on every Chesapeake Ghost Walk. Make a night of it – If meeting up with Chesapeake spirits wasn’t reason enough to buy a ticket for one of these walks, consider that most of the featured towns are designated Maryland Main Streets and / or Arts and Entertainment Districts and all have gorgeous historic architecture, amazing food, shops, cultural venues and recreational opportunities. There’s enough to do to fill a weekend. Guests on a Chesapeake Ghost Walks also learn about “healing trees” and elementals located inside these towns. Healing trees have a strong energy that can be felt when a hand is placed close to the tree for a period of time. Healers, or people who use holistic methods of treating illness, will sometimes visit these particular trees to engage with the tree energy. Ghost Walk guides will demonstrate how to engage with that energy. 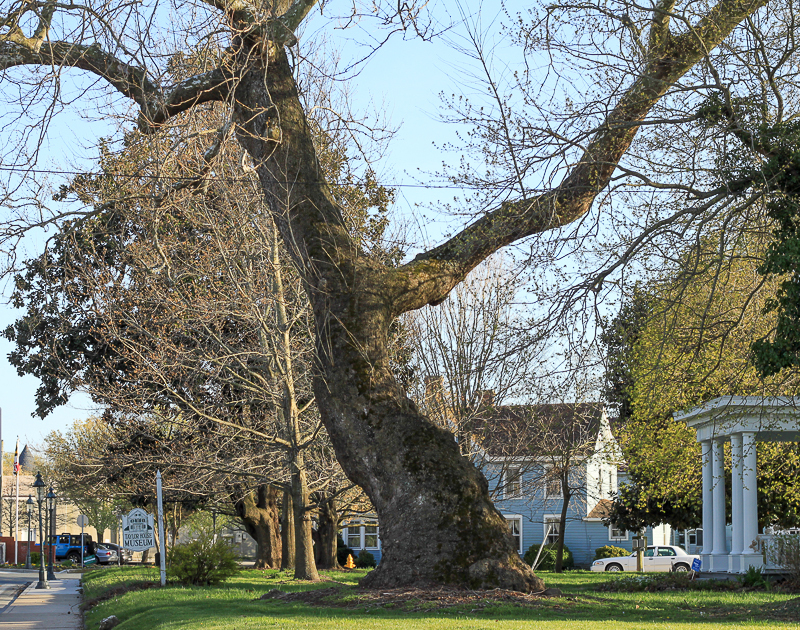 Healing trees are featured on the Easton, Cambridge, Princess Anne and Berlin (2) Walks. One known elemental is present in the Town of Berlin. Our walks combine heritage, folklore and present-day commentary so that each guest has an immersion experience with the town, its characters and its sense of mystery. When you leave a Chesapeake Ghost Walk you’ll feel like the town you toured is an old friend. 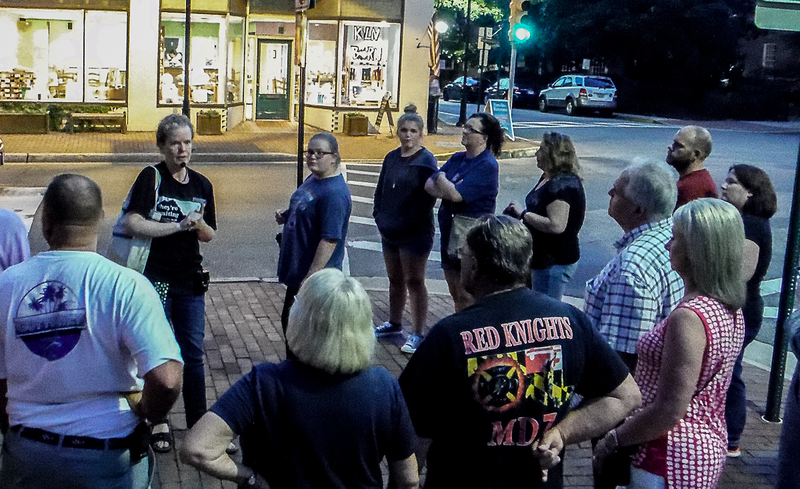 All Chesapeake Ghost Walks are led by certified guides required to be well-versed in the history and ghost-lore of that particular town. They will not only keep you engaged but will also help you discover your own capabilities for sensing spirits. ADVANCED REGISTRATION AND TICKET PURCHASE THROUGH THIS SITE IS REQUIRED. Don’t forget to check out the reviews some of our readers have left on TripAdvisor. We hope you’ll join us for some walks this year. Our bus tours run from Dec- March! You can view our tour calendar to see the specific dates! I have been to many ghost tours throughout Maryland and West Virginia. Although I live in Ocean City, I’ve never attended the tour here till the other night. Mary Raley was an outstanding tour guide. I can say this was the best tour I have ever attended. She was thorough and kept our interest throughout the tour. Hated for it to end and will look forward to her Berlin and Easton tour! Thank you so much, Ann for your kind words about our Ocean City tour and our storyteller, Mary Raley. We appreciate feedback from the guests – good or bad, but when feedback state “outstanding tour guide” and “best tour I have ever attended” we get especially grateful. We appreciate you taking the time to offer your thoughts and we hope to see you another ghost tour some day soon. ~Mindie Burgoyne, Owner, Chesapeake Ghosts. We just went on a ghost walk in Ocean City tonight and really enjoyed the experience. Our guide was knowledgeable, considerate of her group, and thoroughly entertaining. We enjoyed hearing about the history of Ocean City and the residents that lived there. I will be recommending this tour to anyone who we know would like this type of tour. We’ve been on lots of tours in different areas of the country. This was by far the best we’ve ever taken. Hey there, Deb. Thank you so much for your kind words. I enjoyed meeting both of you and hope to see you again someday on another ghost walk. Enjoy your summer. Are you doing any of your Ghost Tours in Ocean City over Easter weekend this year?? So sorry, Shelly. We only have the bus tour – Trail of Sorrows this weekend. Have a great weekend while you’re in town. Hi, Mindy…I attended the function yesterday @ the Dunes Manor where you gave an excellent talk. You mentioned that you think the Pocomoke Forest [PF] is the most haunted place in Worcester County, but that it was hard to find people familiar with its history. I have friends whose family & themselves have lived in the PF for decades if not longer. The wife is also a published author and has interviewed dozens & dozens of PF residents over the years (many long dead now) as part of her research. This morning I asked her if I could give you her name & phone number, since she may be of help to you in your PF research. She said “Yes”. Her name is Ann Bloom / 443-783-7766 P.S. Her husband can also tell a lot of PF stories (he’s a real character!). Hi Sallye. I’m so sorry I didn’t see this earlier. Thanks for the information. I will definitely follow up with Ann. My friend and I thoroughly enjoyed our ghost tour of Ocean City and Mary Beth was wonderful. So informative and fun! We love to hear that! Mary Beth gives a great tour. So glad that you enjoyed it and we thank you for your feedback! We are so happy to hear that you enjoyed your tour, Kathleen! Thank you for your feedback. Hi mindie. This is Andrew Thomas. I am a reporter for Salisbury university TV and I am wondering if I can interview you on Haunted Salisbury university especially Holloway Hall. Just email me acthomas88@live.com Just get back to me as soon as possible.